Dual infrared image of Cassiopeia A on Nov. 30, 2003 (top), and Dec. 2, 2004 (bottom). Anecho has been detected around a star whose death was witnessed 325 yearsago. The reverberation--emanating out inlight, not sound waves--implies that the stellar remnant let out a burst ofenergy some 50 years ago. The dead star in question is CassiopeiaA, whose explosion or supernova was witnessed by Tycho Brahe in 1572. Situated 10,000 light years away, astronomersbelieve a dense neutron star is all that is left of the original star. This neutron star remnant was thought to be resting inpeace, that is, until this recent discovery of a light echoin infrared images taken by NASA's Spitzer Space Telescope. "We had thought the stellar remains inside Cassiopeia Awere just fading away," said Oliver Krause of the University of Arizona. "Spitzer came along and showed us this exploded star, one of the mostintensively studied objects in the sky, is still undergoing death throes beforeheading to its final grave." The evidence for this postmortem activity first came in aSpitzer test image that showed glowing dust features around the dead star. Later observations found that the tangledfeatures had moved outward--apparently at the speed of light. In actuality, the dust hadn't moved, but instead the lightwaves that were exciting the dust had spread out further. This light echo is the largest one everobserved and the first to be seen around a long-dead star. By tracing the echo's light waves backwards, the researchersinferred that some sort of bang occurred on the neutron star back in 1953. This recent activity may mean that Cassiopeia A is an exotictype of neutron star, called a magnetar. These strange objects have surfaces thatrupture and quake, letting loose tremendous amounts of high-energy gamma rays. "Magnetars are very rare and hard to study, especially ifthey are no longer associated with their place of origin," said George Rieke ofthe University of Arizona. "If we haveindeed uncovered one, then it will be just about the only one for which we knowwhat kind of star it came from and when." Further observations with Spitzer may reveal more aboutCassiopeia A's life after death. Riekeand Krause were two of the authors on a paper describing the observations inthis week's issue of the journal Science. 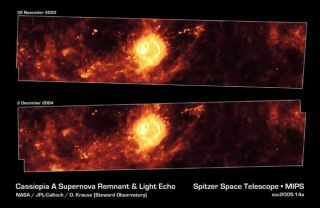 "We had no idea that Spitzer would ever see lightechoes," Rieke said. "Sometimes you just trip over the biggestdiscoveries."